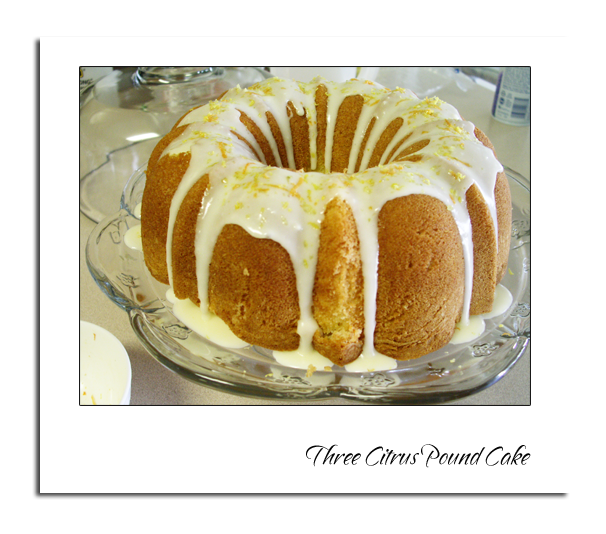 The name Pound Cake comes from the fact that the original pound cakes contained one pound each of butter, sugar, eggs, and flour. No leavens were used other than the air whipped into the batter. In the days when many people couldn’t read, this simple convention made it simple to remember recipes. 1. Heat oven to 350F. Grease and flour 9 to 12-cup Bundt pan or 10-inch angel food cake (tube) pan. Set aside. 2. Grate peel from grapefruit, lemon, lime and orange. 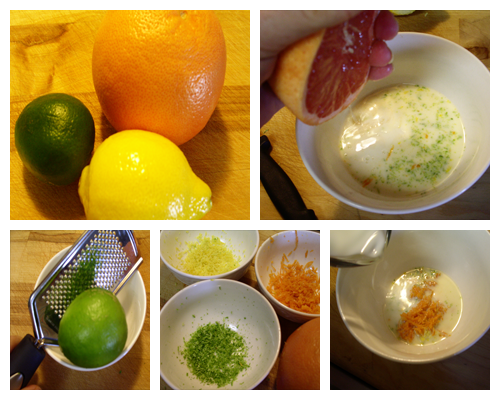 Place 2 tsp each grapefruit, lemon, lime and orange peel in small bowl; add milk and 1 tbsp grapefruit juice. Mix well. 3. Combine butter and sugar in large bowl. Beat at medium speed, scraping bowl occasionally, until creamy. Add eggs, one at a time, beating well after each addition. (Mixture will appear curdled). 3. Stir together flour, baking powder, baking soda and salt in another small bowl. 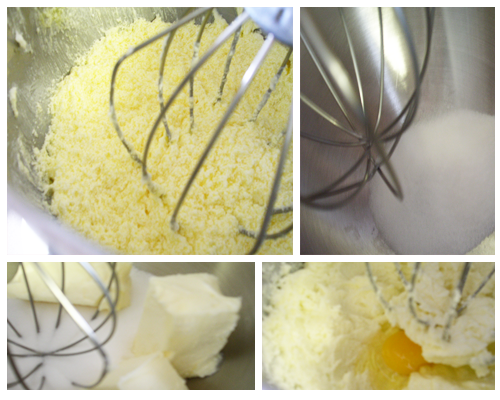 Combine gradually the dry flour mixture to the wet butter sugar egg mixture, alternately add the milk mixture, beating just until moistened after each addition. 4. Spread batter evenly into prepared pan. Bake for 45 to 50 minutes or until toothpick inserted in center comes out clean. Cool pan on wire rack 10 minutes. Remove from pan. Cool completely. 5. Combine 2 tablespoons melted butter and reserved 1 tablespoon grapefruit juice in small bowl. Add powdered sugar; stir until well mixed. 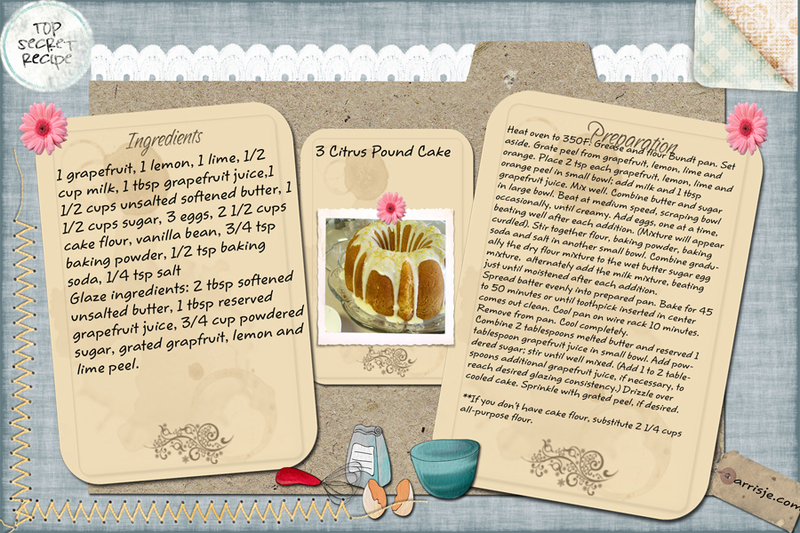 (Add 1 to 2 tablespoons additional grapefruit juice, if necessary, to reach desired glazing consistency.) Drizzle over cooled cake. Sprinkle with grated peel, if desired. Heat oven to 350F. 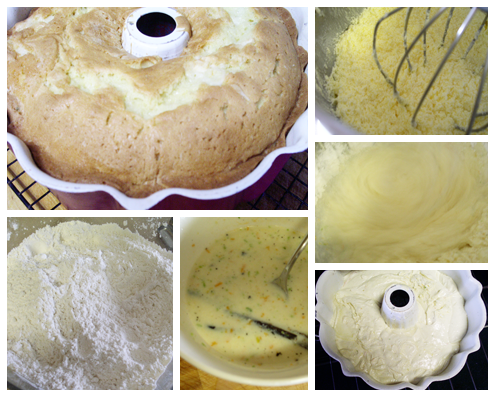 Grease and flour 9 to 12-cup Bundt pan or 10-inch angel food cake (tube) pan. Set aside. Grate peel from grapefruit, lemon, lime and orange. Place 2 tsp each grapefruit, lemon, lime and orange peel in small bowl; add milk and 1 tbsp grapefruit juice. Mix well. Combine butter and sugar in large bowl. Beat at medium speed, scraping bowl occasionally, until creamy. Add eggs, one at a time, beating well after each addition. (Mixture will appear curdled). Stir together flour, baking powder, baking soda and salt in another small bowl. Combine gradually the dry flour mixture to the wet butter sugar egg mixture, alternately add the milk mixture, beating just until moistened after each addition. Spread batter evenly into prepared pan. Bake for 45 to 50 minutes or until toothpick inserted in center comes out clean. Cool pan on wire rack 10 minutes. Remove from pan. Cool completely. Combine 2 tablespoons melted butter and reserved 1 tablespoon grapefruit juice in small bowl. Add powdered sugar; stir until well mixed. (Add 1 to 2 tablespoons additional grapefruit juice, if necessary, to reach desired glazing consistency.) Drizzle over cooled cake. Sprinkle with grated peel, if desired.